Free Shipping On Orders Over $60! (Within U.S.A.) Or, Become a Member and Get FREE! Pope Francis and the Caring Society is a thoughtful and in-depth exploration of the Popes earnest call for a dialogue on building a truly compassionate society. Franciss fervent support for uplifting the poor and protecting the environment has inspired far-reaching discussions worldwide: What is the most effective way to fight poverty? Can environmental resources be better protected with property rights? Are the poor better off under a market economy? And what value does a religious perspective offer in addressing moral, political, and economic problems? Pope Francis and the Caring Society is an indispensable resource for consideration of these vital questions. 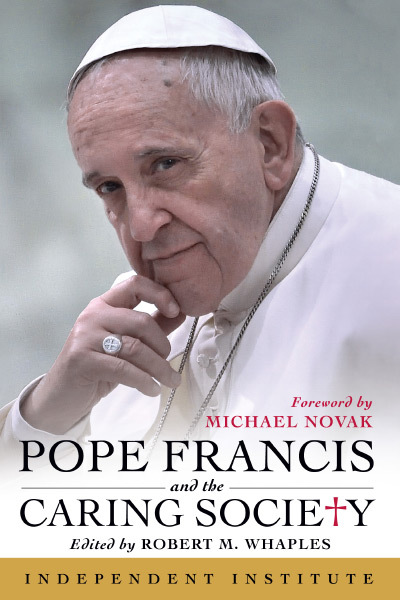 Edited by Robert M. Whaples, with a foreword by Michael Novak, the book provides an integrated perspective on Francis and the issues he has raised, examining the intersection of religion, politics, and economics. Readers will discover important historical and cultural context for considering Franciss views, along with non-bureaucratic solutions for environmental preservation, an analysis of Franciss criticism of power and privilege, the case for market-based entrepreneurship and private charity as the essential tools for fighting poverty, and an examination of Franciss philosophy of the family. Pope Francis and the Caring Society is essential reading for anyone interested in creating a better, more caring, and prosperous world. Friends of human well-being, market-based enterprise, and civil society have a grand opportunity to address widespread misconceptions about the economy, the environment, and charity, thanks to Pope Franciss call for a worldwide dialogue on these subjects. The opportunity for engagement applies not only to the worlds 1.3 billion Roman Catholics, but also to the pontiff himself, who many in the economics profession believe has significantly overestimated the ability of government intervention to foster prosperity, social advancement, and care for the planet. He has also failed to appreciate the crucial roles of free markets, property rights, and private charity. Allaying Pope Franciss worries, world poverty is not rising but falling. From 1988 to 2008, real incomes rose 15 percent for the incredibly poor at the fifth percentile of the worlds income distribution. Those living at the thirtieth to fiftieth percentiles saw their real income rise by more than 50 percent. The worldwide trend toward freer markets especially progress in China and Indiahas played a significant role in global poverty reduction. Contrary to Pope Franciss suggestion that capitalism is the economy of exclusion, private charitable giving is strongest when economic freedom and private-property rights are strong. Private charity is unleashed by applying natural-law, moral and economic principles and can be far more effective and efficient than the government redistribution favored by Pope Francis. The pontiffs concerns about the nature of capitalism therefore undercut his call to help the poor. Pope Francis links what he calls the environmental crisis to the market economy, but most environmental problems result from the tragedy of the commons created by governments failure to embrace and uphold a key pillar of the market economy that fosters free markets: private-property rights. Effective stewardship of what the pope calls our common home is unlikely if we appeal only to peoples virtue and not also to peoples material self-interest, which property rights and the market economy incentivize. By overlooking the importance of property rights, Pope Francis ignores a long tradition of Catholic teaching. Pope Francis does not merely offer caution regarding potential pitfalls of the market economy as his recent predecessors didsometimes he rings the alarm. Yet since the time of Adam Smith (and earlier, in the writings of the Late Scholastics at the School of Salamanca in the late Middle Ages), economists have explained how markets can channel the pursuit of self-interest into creating virtuous communities serving the common good. Pope Franciss lack of appreciation for this benevolent outcome is a clear blind spot. As Pope Francis and the Caring Society demonstrates, intellectual dialogue need not be discourteous (or, at the opposite end of the spectrum, fawning). It can be both respectful and criticalindeed, mutual respect and sensitivity to each sides context are essential foundations for constructive engagement. Contributors to this volume share a commitment to Judeo-Christian teachings and institutions, are conversant in papal history, and are mindful that it is first necessary for two parties to understand one another before they can begin to connect with and educate each other. With his emphasis on service to the poor and care for the planet, Pope Francis (born Jorge Mario Bergoglio) commands the attention of not only the worlds 2.2 billion Christians, including 1.3 billion Roman Catholics, but also of people across the religious divide. In his 2015 encyclical, Laudato si, the pontiff called for an open dialogue about poverty and the destiny of what he calls our common home. This invitation is the inspiration for the Independent Institute book Pope Francis and the Caring Society. Edited by economic historian Robert M. Whaples, Pope Francis and the Caring Society involves the work of eleven scholars well versed in the economics of poverty and the environment, conversant in Church doctrine and history, and attuned to the societal foundations of compassion, stewardship, and charity. While its tone is respectful, the book offers a vigorous engagement with the popes views when they disregard basic economic reasoning and research findings regarding the causes and cures of abject poverty, free markets, and environmental protection. Pope Francis and the Caring Society offers something for people of any creed or worldview. Readers especially concerned about poverty, economic opportunity, and effective charity will gain a clearer understanding of the role of markets, property rights, and wealth creation, as well as a better grasp of the challenges ahead. Those who yearn for a healthier environment will learn what contemporary research says about the role of property rights in ensuring that future generations can enjoy the earths blessings. Spanning the fields of economics, history, theology, and ethics, Pope Francis and the Caring Society shows that compassion without comprehension is folly, that objective analysis is a prerequisite of moral insight, and that a market economy is an essential ingredient for human flourishing. Rather than merely preaching in the public square, it builds a badly needed bridge over the gulf between contemporary scholarship and the head of the worlds most enduring and influential institution. A major gap between Pope Francis and many economistsone that leads many to conclude that the pontiff is antagonistic toward market economiesinvolves differences in their views of the causes and cures for poverty. Some of the divergence results from differences both in terminology and in purpose. To help ensure that economists and the Vatican get past the language barrier, Robert Whaples couches the popes statements in the language of economics. Doing so, he shows, offers enormous value: it enables a clearer understanding of precisely where the pontiff and the economists differ, especially as they relate to the poor and the rich. Whapless translation reveals that many differences involve matters of economic fact and causation, and therefore can in principle be resolved if everyone considers the same lines of evidence. The clash involving conflicting values, on the other hand, may be far more difficult to cover. To help build a bridge across the divide, Whaples creates a platform on which connecting links might be constructed: he discusses capitalisms strengths (as seen by its advocates) and weaknesses (as seen by those skeptics who agree that business can be a noble calling). The two sides can learn much by seeing the contrasting assumptions laid out in plain view. Pope Francis isnt the first pope to express concerns about the potential ills of a market economy, explains Andrew M. Yuengert. However, unlike Popes Paul VI, John Paul II, Benedict XVI, and other predecessors, Pope Francis claims that the harmful potential has become a grim realityand will remain so unless market forces are brought under deliberate human (i.e., government) control. This hostility to markets, according to Yuengert, runs the risk of hindering constructive engagement with business leaders and market advocates. It can also stir cultural and political currents that lead to restrictions and predatory bureaucracy more likely to drown out economic progress than to encourage it. How did Pope Francis come to hold views so critical of the free market? To shed light on the origins of those attitudes, Samuel Gregg examines the economic failures that have plagued the pontiffs country of birth, Argentina. Once among the richest countries of the Western Hemisphere, Argentina long ago fell victim to corruption and cronyism that have brought wealth-destroying inflation and economic stagnation. One early cause of those failuresthe populist collectivism and legacy of Juan Perónis, ironically, an ideological relative of the popes teología del pueblo (theology of the people). Pope Franciss mistrust of the market economy does not, however, necessarily mean that free-market advocates can pin the label of socialist on the popes ideas. According to Gabriel Martinez, Pope Francis does not generally oppose increases in prosperity and economic liberty; he criticizes pro-market rhetoric when its used to justify indifference to the poor. Their plight, Martinez argues, is often caused or compounded by anti-market institutions embedded in the economies in which they live, especially where entrenched oligarchies use the state to hobble their would-be competitors and redistribute wealth from the public to those in power. Societies marked by oligarchy, that is, rigged to help the privileged elites at the expense of everyone else, require more than merely the removal of anti-competitive rules and regulations. The reason, according to Martinez, is that not all forms of economic liberalization are equally good: some reforms can be so inadequately designed as to harm the interests of the poor, especially in the short term. This raises the questions: Are the poor better off under a market economy? Is the invisible hand conducive to giving people a hand? Pope Franciss assessment is often negative. [U]nbridled capitalism, he has claimed, has taught the logic of profit at any cost, of giving in order to receive, of exploitation without looking at the person. Such a bleak assessment, however, is not an accurate description, according to Lawrence J. McQuillan and Hayeon Carol Park. Contrary to the popes pronouncements, McQuillan and Park argue, capitalism and its core institutionsprivate-property rights and economic freedomare enablers of philanthropy, not its enemies. Economic freedom and the enforcement of property rights, they show, are positively correlated with charitable giving. In contrast, the government redistribution often advocated by Pope Francis is neither effective (it slows down wealth creation, the source of charity) nor at all charitable (its funded through coercive taxation rather than voluntary means). Going beyond care for the poor, how well does a free-market system treat the environment? A. M. C. Waterman examines Pope Franciss analysis of the environmental crisis. Although the pope is on target in his admonition against worshipping the false god of a deified market, according to Waterman, his encyclical Laudato si is flawed, due in no small measure to its failure to acknowledge the good that markets do by channeling self-interest to serve the common good. This includes the incentives that free markets and private property create for promoting environmental stewardship. It is hardly news that private-property rights, when they are tradable and enforced, prevent the rise of environmental problems created by the tragedy of the commons. Less known, Philip Booth explains, is that a growing body of research (the kind that won Elinor Ostrom the 2009 Nobel Memorial Prize in Economic Sciences) shows that property rights can be structured in numerous ways that empower communities to manage common-pool resources in a manner consistent with church doctrine. This is further reason why Pope Francis should not overlook the importance of property rights in Catholic social teaching. The family, even more than the marketplace and the environment, is the foundation of human well-being. Pope Franciss family ethic rests, Allan C. Carlson explains, on a rejection of individualism, equity feminism, current gender theory, and consumerism. The pontiff s economic alternative to the contemporary, liberal social order involves communalism and a return in significant ways to a home economy featuring traditional gender roles. Nevertheless, Carlson believes that Pope Francis overlooks a major source of stability for the traditional family. Francis gives too little attention to the importance of private property as a guarantor of family security and basic well-being, he writes. The tension between economics and religion is not an outcome inherent in the nature of either domain, Robert P. Murphy argues in the concluding chapter. The problem stems from a failure of both camps to fully recognize that (1) economic principles were first discovered from Christian teachings by Catholic scholars in the Middle Ages, and (2) the economics profession and the Catholic Church have different areas of expertise. "Responding to Pope Francis's welcome call in Laudato si' for dialogue, the authoritative book Pope Francis and the Caring Society is the perfect antidote for the toxic folly of command economies that have long kept billions of people in hopeless destitution and misery. Only the moral process and dynamic creativity of free enterprise and private charity can overcome poverty and create widespread human flourishing worldwide. Grounded in the enduring, Judeo-Christian, natural-law principles of liberty and civic virtue, this fascinating book will inspire and guide people on how to care for those in need to have healthy, prosperous, and rewarding lives. Pope Francis and the Caring Society is highly recommended and must reading." Mary S. Poplin, Professor of Educational Studies, Claremont Graduate University; author, Is Reality Secular? Thank you for the copy of Pope Francis and the Caring Society edited by Robert M. Whaples. I have read all of the reviews which you sent with the book and look forward to finding the time to read the book carefully. As the pope himself has called for dialogue, the gathering of responses and critiques from theologians, economists, political scientists and historians in one volume is a great step towards that goal." "Thank you for your thoughtfulness in sending me a complimentary copy of Pope Francis and the Caring Society, edited by Robert M. Whaples. This timely publication will be invaluable as we struggle to fight poverty and build a compassionate world." "Pope Francis and the Caring Society is a collection of essays edited by Robert M. Whaplesa research fellow at the Independent Institute and a professor of economics at Wake Forest University. He introduces the volume with a good essay outlining the main themes of the pope's thought and he has assembled a stellar cast of experts to consider Pope Francis's thought in a spirit of dialogue and comment. . . . While this book obviously comes at the problem from a conservative viewpoint, it does so with admirable balance, expertise and reasonable argument. While the authors defend capitalism, they also understand the system's weaknesses and they write with heart-genuinely sharing the pope's concerns if they do not share all of his proposed solutions. As a non-expert I found some of the discussion to be too technical and in depth, but most of the essays were written in a clear styleexpert but accessible. While some of the criticisms of Pope Francis were astringent, all was argued with a respectful tone by experts who genuinely wished to contribute constructive comments to the ongoing debate. Pope Francis and the Caring Society raised two questions in my mind which were truly disturbing. Given that American materialism does need a profound, reasonable and sensible critique, it is a great shame that the only critique has come from a pope who, quite simply, doesn't have the philosophical, global and historical muscle to provide it. . . . Given the difficulty of the game, the ineptitude of the gladiator is disappointing. Therefore, the second question is even more pressing. For a document like Laudato si' a pope must rely on a range of experts to advise him. Were none of the expert contributors to this book (not to mention the distinguished academics who piled up ten pages of long recommendations at the front of the book) available to serve on the pope's team? We don't know who the pope's advisors were, but if he is writing on global economics and environmentalism it would seem that his board of advisors were remarkably one-sided. The pope is the only religious leader who has a global platform. Did he have advisors from around the world and from both sides of the debate to direct his thinking so that he might issue a teaching that was balanced, intelligent, reasonable and constructive? Unfortunately, Laudato si' sometimes reads more like a semi-socialistic college rant rather than a balanced, wise and erudite teaching guided by the Holy Spirit. While one appreciates the pope's concern for the environment and his passion for the poor, Pope Francis and the Caring Society shows that 'he could have done better.'" "Thank you very much for sending me the book, Pope Francis and the Caring Society. It was kind of you to think of me. . . . I will certainly do what I can to promote what looks to be an excellent work!" "Pope Francis and the Caring Society is an outstanding book challenging the flawed economics behind Franciss simplistic view that capitalism is evil and government redistribution of income is good. On the contrary, true charity is only possible when it flows from individuals, not governments. Capitalism enriches societies and enables individuals to act more, not less, charitably. This great book demonstrates that government aid is dead aidit perpetuates dependence, robs the working poor of their dignity, and deadens the charitable impulse by crowding out private efforts which are far more effective. In short, capitalism is an expression of giving, first in the marketplace, then in civil society where individuals and associations are remarkably generous in their giving. If I could put one work in the hands of Pope Francis, it would be this outstanding volume." "Pope Francis and the Caring Society, edited by Robert Whaples, a Roman Catholic professor of economics at Wake Forest University, is an interesting book because the essays it contains includes important normative questions. The books exposes the apparent differences between so-called 'capitalist economic thinking' on the economy and that of what Francis, the most important and literate pope in centuries, charges against 'capitalist thinking' on government sponsored redistributions, public charity, the environment and acute problems in income distribution. (Interestingly Roman Catholicism, from the beginning, engaged in much of the kind of monopoly behavior Francis now criticizes). Some but certainly not all the contributors understand, as Francis, a possibility that actual capitalism in much of the world has produced reduced economic growth through rent- seeking regulation, global warming through 'growth,' and (possibly) widening disparities in income distribution. (Forbes calculates a fast-growing category of over 1800 billionaires in the world). These issues are of great importance and normative debate is necessary, especially a debate that includes the importance of religious, political and social institutions. Only hard evidence, not ideology or religious apologia, will suffice to answer these questions." "Last month I interviewed Dr. Robert Whaples, a Catholic economist, writer, and researcher, who has edited and contributed to the new book Pope Francis and the Caring Society. The book allows conservative voices to express their views about how best to save the world. Contributors (including high-profile commentators like Samuel Gregg, Philip Booth, and Robert Murphy) both support Pope Francis and many of his views, but also critique many of his economic ideas. The book provides support for the value of the market economy and private property in ecological protectiontwo realities that are abhorred by many eco-advocates (who tend to be left-leaning, or very much so). Whether or not you like what the contributors are saying, we should all applaud their entry into the very dialogue that Pope Francis has asked for. Indeed, this book, and the conference that inspired it, are hopeful first steps in this dialogue. Such efforts are, after all, signs of stirrings within the conservative world that we Catholic ecologists should encourage, listen to, and even learn from in 2018." "Many political pundits have weighed in on Pope Francis, particularly after his encyclical On Care for Our Common Home (Laudato Si') was published. The Independent Institute's book-length contribution offers to intelligently further the conversation surrounding issues of the day on which the pope has been outspoken. It seems the contributors are likeminded, but it is important to note that this book is not a 'compassionate conservative' screed (paleo- or neo-). The publisher is a non-partisan think tank, albeit with somewhat libertarian leanings. Labels, however, should not discredit this book, which begins with ten pages of endorsements from disparate people, primarily academics, including the bishop of Oakland, California, where the institute is located. Pope Francis and the Caring Society is a helpful collection of essays centered around what Michael Novak describes in his foreword as an effort to educate readers about the 'legacy and meaning of the natural law, moral and economic principles of liberty, personal responsibility, enterprise, civic virtue, family and community, and the rule of law' (xix). This may seem like a lot to take on in one modest tome, especially when it is also responding to current papal statements. Nonetheless, Pope Francis's call for deeper discussion of what it means to be a caring society in the modern world is the common thread to the book and the responses are not univocal. The essays offer a variety of well-thought-out and interesting views that add to the dialogue that Pope Francis has asked to be sustained. The book employs footnotes, and there are extensive bibliographic references at the end of each chapter, including the substantial introduction by the editor. The best audience for this book would be well-educated individuals who are interested in the intersection of religion, politics, and economics. Recommended for college, university, and seminary libraries." "I admire Pope Francis and the Caring Society . . . . I fully agree with the authors that capitalism is far more productive and protective of a good life for all so long as morally conceived . . . and that Francis is misled in his hostility toward it; I am fairly convinced that the hostility has its source, as Samuel Gregg argues, in Francis's experience of a corrupted oligarchic conception of capitalism in Peronist Argentina, and Francis should be wise enough to see what his predecessors have grasped. And I am amused (there is no other way to put it) that when Francis practically endorses a life among the poor as morally superior to a life blessed (I would say) with material possession, his rhetoric (according to Gregg again) is very ironically 'very reminiscent of Juan Perón, his wife, Evita Perón, and contemporary Peronist leaders.' Nonetheless, if Francis frightens people who judge the conservative disposition by how closely it reflects conventional economic endorsements of capitalism and definitions of property, they should know that Francis cannot hold a candle to John XXIII, to say nothing of Saint Thomas Aquinas. . . . That, I admit, is going a bit over the top-especially since I myself, failing to practice what I preach, have presumed to suggest that Francis might better instruct himself about some economic matters to which he has given insufficient thought. . . . Professor Whaples and his colleagues have collaborated in what is in effect a provocative seminar-in-print that the reader (or this one at any rate) cannot help but wish to join the conversation. That is the highest compliment to a collection of essays that I can imagine." "Robert M. Whaples has compiled a collection of interrelated essays called Pope Francis and the Caring Society. Whaples, along with ten other Catholic voices active in economic and environmental affairs, examines the various economic, environmental, familial, and historical claims made by Francis in Laudato si' and throughout the rest of his papacy. Fortunately, the collection strikes just the right balance between charitable and critical. Each contributor approaches the Holy Father with the respect due to his office and with a genuine eye toward charitable interpretation, despite concerns that Francis' claims are underdeveloped, misinformed, or hyperbolic. The collection is an excellent tool for those seeking an introduction to Francis' economic and environmental policies. It grounds both in his wider pastoral approach and the long history of Catholic Social Teaching articulated by his predecessors. Though the volume is not without its own flaws-including some unhelpful graphsit is on the whole thorough, well researched, and devoid of the inflammatory rhetoric that has caused so much anxiety during the Holy Father's papacy. One of the most interesting arguments raised by the collection is that the free market system has the most potential for economic, social, and environmental good because itperhaps unintentionallyworks within the limitations of human nature. . . . For those looking for an introductory exploration of Francis' economic and environmental claims, Pope Francis and the Caring Society is the perfect starting place. The essays can be read in or out of sequence and generally provide focused and well researched considerations of the strengths and weaknesses of Francis' vision. More importantly, they allow the reader himself to participate in Francis' call for dialogue by providing him with several informed perspectives to consider within the context of Francis' own." "Pope Francis and the Caring Society is a thoughtful exploration of the Pope's earnest call for a dialogue on building a truly compassionate society. . . . Readers will discover important historical and cultural context for considering Francis's views, along with alternative solutions for environmental preservation, a defense of Francis's criticism of power and privilege, a case for market-based entrepreneurship and private charity as potent tools for fighting poverty, and an examination of Francis's philosophy of the family. Pope Francis and the Caring Society is essential reading for anyone interested in creating a better, more caring, and prosperous world." "Pope Francis has sparked uproar with inflammatory comments on capitalism and markets based on his passion to help the poor and his experience of crony capitalism in Argentina. He has called for a dialogue on building a compassionate society and the Independent Institute has responded with a high-powered collection of papers led by the late and great Michael Novak who wrote the Foreword not long before he died in February last year. The book is Pope Francis and the Caring Society. Many of the contributors are Christian believers of various kinds and they have made a big effort to embrace the dialogue on the assumption that Pope Francis is genuine in his humanitarian concerns and in the hope that he might be prepared to learn some economics like the great Polish Pope John Paul. Economic issues are thoroughly treated, especially the power of markets to liberate the poor if only there is a framework of law and property rights and a vibrant civil society. Several contributors pay attention to the Pope's wayward and scientifically illiterate views on the environment and ecological issues."